Knowledge Base > Forms > Can I share my form with external persons? Yes, you can easily create a webform. Go to your app, click on “application settings” (), and click on “ Share externally”. Click on “Share App” and use the fast link to share your form with others. 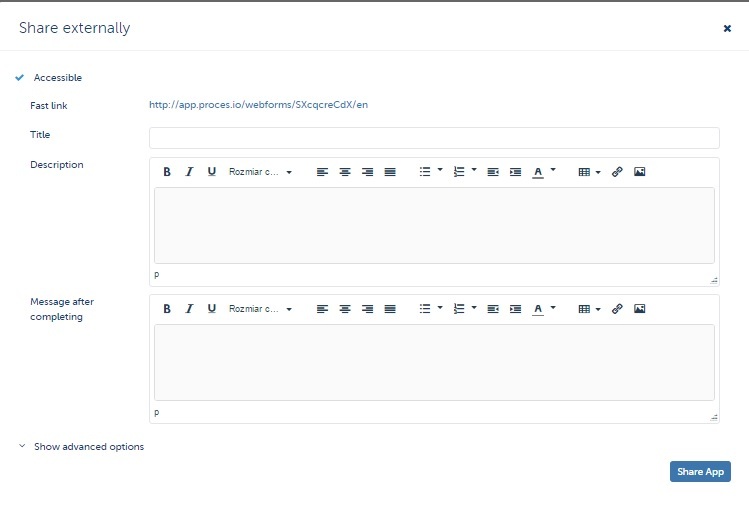 You can also add a title and a description to your webform, as well as a text, which will appear, after the web form has been filled in. You will also will advanced options. When you change something, make sure to click on “share app” again. The link will be the same. External persons will only see the first form. After the form has been filled in, the workflow will proceed with the following steps, which will be taking place inside of Proces.io.